Leroy Luetscher was working in his back garden when he dropped a pair of pruning shears, which landed point-side down in the ground. When Luetscher went to pick them up, he lost his balance and fell face-down on the handle. 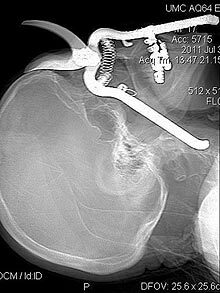 The handle penetrated his eye socket and went down into his neck, resting on the external carotid artery. Half the shears were left in his head, while the other half was sticking out. Advanced, out-of-hospital procedures such as intravenous access are commonly performed by emergency medical services (EMS) personnel, yet little evidence supports their use among noninjured patients. We evaluate the association between out-of-hospital, intravenous access and mortality among noninjured, non–cardiac arrest patients. Methods: We analyzed a population-based cohort of adult (aged ≥18 years) noninjured, non–cardiac arrest patients transported by 4 advanced life support agencies to one of 16 hospitals from January 1, 2002, until December 31, 2006. We linked eligible EMS records to hospital administrative data and used multivariable logistic regression to determine the risk-adjusted association between out-of-hospital intravenous access and hospital mortality. We also tested whether this association differed by patient acuity by using a previously published, out-of-hospital triage score. Results: Among 56,332 eligible patients, half (N=28,078; 50%) received out-of-hospital intravenous access from EMS personnel. Overall hospital mortality for patients who did and did not receive intravenous access was 3%. However, in multivariable analyses, the placement of out-of-hospital, intravenous access was associated with an overall reduction in odds of hospital mortality (odds ratio=0.68; 95% confidence interval [CI] 0.56 to 0.81). The beneficial association of intravenous access appeared to depend on patient acuity (P=.13 for interaction). For example, the odds ratio of mortality associated with intravenous access was 1.38 (95% CI 0.28 to 7.0) among patients with lowest acuity (score=0). In contrast, the odds ratio of mortality associated with intravenous access was 0.38 (95% CI 0.17 to 0.9) among patients with highest acuity (score ≥6). Conclusion: In this population-based cohort, out-of-hospital efforts to establish intravenous access were associated with a reduction in hospital mortality among noninjured, non–cardiac arrest patients with the highest acuity. Reasons why this occurred (cause and effect) could not be determined in this model. Temporary emergency room nurses who are unfamiliar with their surroundings may inadvertently be a threat to the patients they serve, according to new research from Johns Hopkins University School of Medicine. The study found that the temporary help was twice as likely as permanent staff to be involved in medication errors in the hectic and fast-paced environs of the ER. However, the study’s authors stressed that temporary nurses should not necessarily be blamed for those shortcomings, which the researchers said are complex and diffuse. Although marketed as “bath salts,” this increasingly popular drug isn’t being used in the tub, but rather is sending people to the emergency room for paranoid delusions, rapid heart rates and high blood pressure. The Tri-City area is just starting to see the drug show up. It’s being sold with street names like Drone, Ivory Wave, Lunar Wave, Monkey Dust, Vanilla Sky and White Rush. It is sold as fine white or off-white powders and resembles typical bath salts. Study objective: We examine practical aspects of collecting time-based emergency department (ED) performance measures. Conclusion: There is great variation in performance between EDs in time-based ED measures. There are multiple reporting benefits. Reporting burdens seemed to lessen after data systems were established. The CMS sample size requirements for throughput measures may not be optimal compared with actual ED throughput data. Many of the state’s 30 rural hospitals, once the heart of their communities, are struggling to find a niche in a health care system that values the complicated procedures offered at large hospitals much more than the basic and emergency services provided by rural hospitals. Less than half the beds in those 30 hospitals were filled on an average day from 2007-09, according to a Medicaid/Medicare study. Their occupancy rate dropped by 8 percent during that period. Ten of the smallest 13 hospitals operated at a financial loss in those years; the seven smallest lost $34.5 million. Rural hospitals are caught in a vicious cycle. They don’t have the customer volume to help pay for new technology and facilities that might lure specialty physicians to rural areas. But without those specialists, the hospitals can’t perform the procedures that bring in the most money to pay for new technology and facilities. The impact of a computerised whiteboard system on digit preference bias in the recording of emergency department process times. OBJECTIVE: Digit preference bias has previously been described in a number of different clinical settings including the emergency department. This study aimed to assess whether the implementation of a computerised recording system affects the digit preference bias in recording of times of arrival, assessment and departure at an emergency department. METHODS: A preintervention/postintervention study was undertaken in a type 1 district general hospital emergency department that receives approximately 70 000 attendances per annum. Consecutive 8-week samples were taken before and after the introduction of an electronic whiteboard/patient tracking system. Timings of arrival, nursing and medical assessment and departure were compared. RESULTS: Twelve thousand four hundred and ninety-three patients presented during the 8-week control period and 11 758 patients presented in the 8-week period after the introduction of electronic data capturing. Within the control group, over 80% of the nursing assessment (82.7%), medical examination (92.5%) and departure times (92.7%) ended in ‘0’ or ‘5’, compared with just over 20% after electronic recordings (22.0, 21.7 and 21.8% respectively). CONCLUSION: The introduction of the patient tracking system eliminated the digit preference bias found in recording of the time of nursing assessment, examination and departure that was present in the preintervention data.